between pro football and the movies. If the first thing you think of when I say “Wings” is “tasty snack to have while watching an NFL game” instead of “first film to win the Academy Award for Best Picture — 1927,” then it’s clear that you’re more interested in the screen pass than the silver screen. Ditto if “Marty” immediately calls to mind “Schottenheimer” instead of the Oscar-winning role for Ernest Borgnine in 1955. You can’t really be blamed for wondering if one of this year’s Best Picture nominees — “Extremely Loud and Incredibly Close” — might be about a goal line stand at Qwest Field … but it’s not. On the other hand, if you think Terry Bradshaw was jobbed by the Academy because he didn’t get a Best Supporting Actor nomination for “Failure to Launch”, then you obviously love it when the NFL and Hollywood get together. When the baseball film “Moneyball” is announced along with the other nominees in the Best Picture category Sunday night, it will serve as a reminder that other sports have fared much better in Hollywood than pro football. Boxing had “Rocky”, billiards has “The Hustler” and even bowling has “Kingpin”; all have better movies than pro football does. Over the 83 years that Academy Awards have been handed out, “Heaven Can Wait” in 1978 is the only pro football movie ever to be nominated for Best Picture. * Plus, you could make a persuasive case that it was more of a romantic comedy than a movie about pro football. Cuba Gooding Jr. is the only actor to win an Oscar (Best Supporting) for playing an NFL player — the Arizona Cardinals’ fictional wide receiver Rod Tidwell. That was in “Jerry McGuire”, another movie that had more romance and comedy than pro football. Why haven’t there been any great movies about pro football? Why haven’t there even been many good ones? For one thing, the spontaneous, unpredictable excitement of a great game can’t really be conveyed within a fictional context. No screenwriter could come up with “The Immaculate Reception”, “The Catch” or “The Music City Miracle.” NFL Films realized almost from its inception that if you give the Hollywood treatment to something that actually happened, it enhances the drama of the real event. Hollywood’s approach to pro football has entailed an emphasis on the artificial. 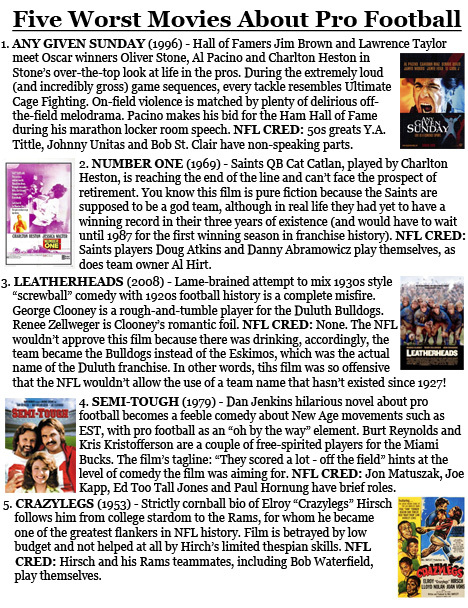 Movies about pro football generally seem forced or clichéd. Maybe that’s why the studios would rather make movies about college football — “Rudy” — or high school football — “Remember the Titans”. In these forms, filmmakers can let the corn grow tall. Audiences seem to love it. NFL fans, on the other hand, are used to authenticity, and Hollywood rarely has been able to deliver. Maybe the most successful pro football movies are the ones where the sport is part of the plot but doesn’t drive the plot itself. I’ve already mentioned “Jerry McGuire”, but also important here are films like “Diner” and “Buffalo ’66”, in which football fandom is essential to defining the characters. The grungy ex-con in “Buffalo ’66” has a mother who worships the Bills, and he also holds a serious grudge against the kicker who missed a game-winning field goal in Super Bowl XXV. *** I would also point to films like “The Fortune Cookie” directed by the great Billy Wilder and an Oscar winner for Best Supporting Actor (Walter Matthau). In this film, a TV cameraman gets walloped on the sideline by a Browns receiver and then reluctantly agrees to bilk his insurance company. While the insurance scam in “The Fortune Cookie” is played for laughs, the relationship between pro football and crime seems to be a recurring theme in Hollywood’s treatment to pro football. Movies such as “The Last Boy Scout”, “Black Sunday”, “Two-minute Warning” and “Against All Odds” use the game as a backdrop to murder and corruption. It’s as if the filmmakers didn’t trust the sport to produce the tension and drama essential to a good movie, so they pushed the game into background and instead emphasized sordid behavior and criminal enterprise. While the Rams enjoyed some successful seasons in Los Angeles, the pro game has never really been embraced by Hollywood. This would seem odd on the surface, given the close ties between movie stars and pro football during the 1940s. Actor Don Ameche owned the L.A. Dons of the old AAFC from 1946 to 1949. Bob Hope was part-owner of the Dons, and when the rival league folded, he bought a stake in the NFL’s Rams. The marriage between the NFL and Hollywood was literal as well as figurative. Rams quarterback Bob Waterfield was married to Jane Russell, one of the biggest stars of the ’40s, while the team’s running back, Glenn Davis, briefly was wed to starlet Terry Moore. The Rams moved from Cleveland to Los Angeles in 1946, and the first professional sports franchise on the west coast created some buzz. Tinseltown capitalized by producing a few pro football-related pictures. “Triple Threat” tells the tale of an egotistical college star who joins the pro ranks and continues to act like a fathead. 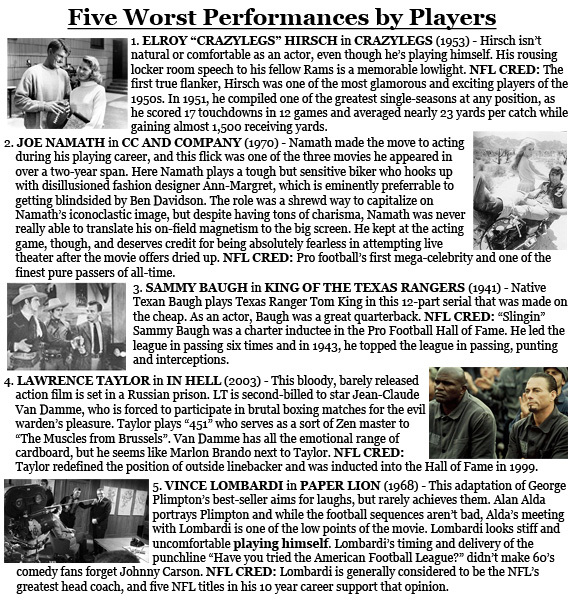 This film proudly proclaimed it was “filmed with the cooperation of the National Football league.”**** In “Triple Threat”, the selfish protagonist is ultimately taught that there’s no “I” in team by real-life players of the era including Paul Christman, Bullet Bill Dudley and Slingin’ Sammy Baugh, all of whom play themselves. The presence of actual players, coaches and broadcasters has always been a tried-and-true device employed by Hollywood to give a pro football film instant credibility. Many players actually gave acting a whirl. Baugh had played a Texas Ranger in a low-budget serial entitled “King of the Texas Rangers”. After Red Grange turned pro, he made two silent films: “Two Minutes to Play” and “A Racing Romeo”. 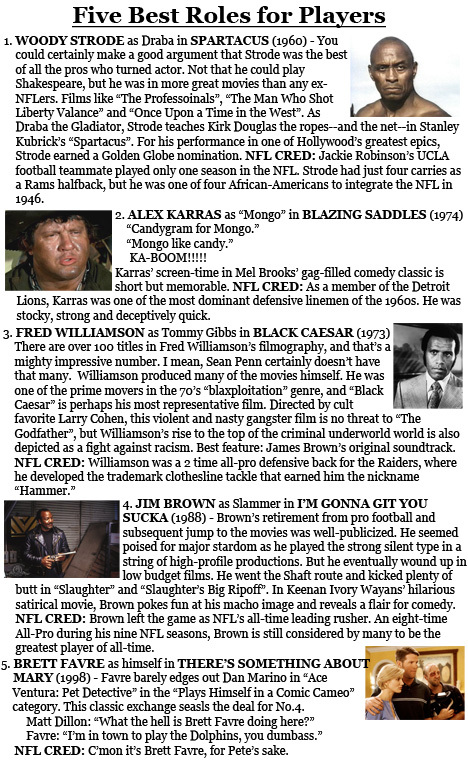 Woody Strode, Jim Brown, Joe Namath and Terry Bradshaw are just a few of the many NFL players who tried their hand at acting, with varying degrees of success. It’s interesting that many of the players-turned-actors are quarterbacks. It would seem that quarterbacks have to do a certain amount of “acting” during the course of a game — play-faking, barking out a hard count or selling a trick play. Quarterbacks are the most charismatic players on their teams in most cases (with the exception being Rex Grossman) so it figures they’d be natural born performers. It hasn’t quite worked out that way, as anyone who’s seen the complete oeuvre of Joe Namath can attest. Oddly enough, Burt Reynolds and Dennis Quaid portrayed more pro football players on screen than Jim Brown, Joe Namath or Woody Strode. Reynolds is an ex-pro QB turned convict in “The Longest Yard”, and is one of the stars of the Miami Bucks in “Semi Tough”. Quaid plays Redskins halfback Gavin Gray in “Everybody’s All American” and the injured quarterback in “Any Given Sunday”. Maybe if Brown or Namath had played characters who were close to their own professional experience, they might have earned Oscar nominations. Then again, given the uneasy relationship between Oscar and pro football, that could be wishful thinking on my part. On Oscar night, the closest the NFL will come to getting a whiff of an Academy Award is when Rooney Mara is announced as one of the Best Actress nominees, Mara is a member of two great football families, the Steelers (Rooney) and Giants (Mara). She’s excellent in her breakout role in “The Girl with the Dragon Tattoo”, but isn’t favored to win the award. But then, the Giants weren’t favored to win Super Bowl XLVI or Super Bowl XLII, though. Even if Ms. Mara can’t pull an upset, her families can boast a combined 10 Lombardi Trophies. I think that trophy means more to us than a silly old Oscar anyway.